In January 1921 Martin Travers produced a wooden War Memorial Tablet for £33. It was decided to include the names of those who had actually resided in Broadstone together with husbands, brothers and sons of the inhabitants. This afternoon a bronze tablet containing the names of 24 old scholars who fell in the Great War was unveiled by the Head Teacher. who died age 37 on 9th June 1917.
husband of Lily Ann Gould, of St Bedes, Melrose, Roxburghshire. Returned from U.S.A. to join the Army, Sept., 1914; gazetted Nov., 1914. Remembered with honour KLEIN-VIERSTRAAT BRITISH CEMETERY, Heuvelland, West-Vlaanderen Belgium. II.C.15. Klein-Vierstraat British cemetery was begun in January 1917 and Plots I to III were made by field ambulances and fighting units before the middle of January 1918. After the Armistice, graves were brought into Plot I, Row H, and Plots IV to VII, from two smaller cemeteries (Ferme Henri Pattyn Vanlaeres, Poperinghe and Mont-Vidaigne Military Cemetery, Westoutre) and from the battlefields of Dikkebus, Loker and Kemmel. Klein-Vierstraat British Cemetery now contains 804 First World War burials, 109 of them unidentified. Major Gould is also remembered on Broadstone War Memorial in the recreation ground. 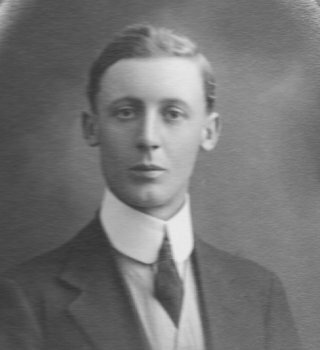 Eldest son of Mrs Gould of ‘Redroofs’, who was killed on June 9th. He was a Major in the RFA. On the 1881 census Major Gould’s father was a bookseller, and in 1891 a photographer living in Surrey Road, Branksome. In 1901 there were no listings for Chalkley Gould or his father, but it is believed his brothers, John and Horace, were living in Alumhurst Road, Bournemouth, both photographers. who died age 32 on 31 March 1916.
of "Kennaa," Broadstone, Dorset. Born in Zanzibar, East Africa. Second Lieutenant Gribbell is also remembered on Broadstone War Memorial in the recreation ground but erroneously as LT Gribbrell. He is also on the Memorial in St Johns Church, Broadstone. 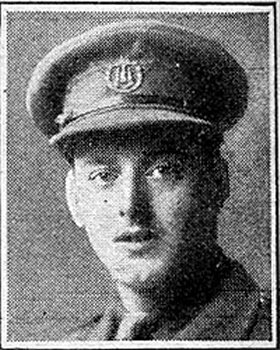 We deeply regret to record the death of Lt Gribbell of 3rd Bn., Devonshire Regiment, the son of Mr & Mrs WH Gribbell, of Kennaa, 14 Golf Links Road. 2nd Lt. Gribbell came home from the Argentine about a year ago in order to offer his services to the Motherland in her hour of need, and soon afterwards was given a commission in the Devons. He was so keen on his work that, unfortunately, he continued to go on with his duties after he had been attacked by measles with the result that double pneumonia set in. Everything possible was done for him at the hospital in Devonport but he sank and in a few days passed away. He was accorded a military funeral from the hospital to the railway station, and representatives of the officers together with three buglers, came up from the regiment to pay him the last honours at Broadstone Cemetery. At the conclusion of the service at the graveside the Last Post was sounded. He was honoured and beloved alike by officers and men. He had received his education at the United Service College at Westward Ho and was the last Captain of the college and recipient of the Gold Medal before the institution was moved. Our sincerest sympathies go out to the bereaved parents and other relatives. According to the 1891 census the Gribbell family was living at Prussia Road, Hoylake. Leslie aged 7, his brother William aged 14 and sister Ethel aged 19. His father was at this time the Navy Fleet Paymaster RN. In 1901 they were living at Wear Villa, Raleigh Estate, Northam, near Barnstaple and William was not with them. This was perhaps when Leslie was attending the United Services Colllege at Westward Ho! where Kipling had been a pupil before him. 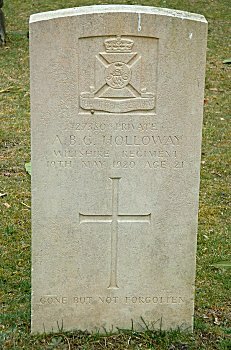 His father is recorded in Kellys of 1911, 1915, 1920 and 1923 as living in Broadstone and is also buried in Broadstone Cemetery. Villers Station Cemetery was begun by the French but was used by Commonwealth divisions and field ambulances from the time they took over this part of the front in July 1916 until September 1918. It is associated particularly with the Canadian Corps whose headquarters were nearby and many of the graves in Plots V to X date from April 1917 and the Battle of Vimy Ridge. Villers Station Cemetery now contains 1,208 Commonwealth burials of the First World War and 32 German war graves. 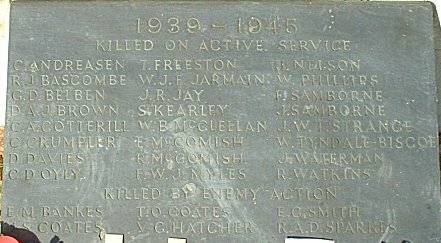 Private Griffin is remembered on Broadstone War Memorial in the recreation ground, on the Memorial in St Johns Church, Broadstone and on the Broadstone First School Memorial. 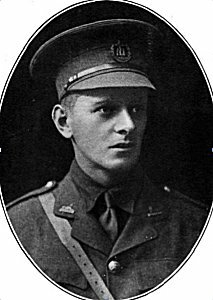 He is also commemorated on Page 248 of the First World War Book of Remembrance of the Veterans Affairs, Canada, see over the page. The 46th Battalion served with the 10th Infantry Brigade, 4th Canadian Division from 11 August 1916 until the Armistice. The unit has come to be known as "The Suicide Battalion". The 46th Battalion lost 1,433 killed and 3,484 wounded - a casualty rate of 91.5 percent - and won 16 battle honours in 27 months. After relief on 24 November, the 46th Battalion spent two weeks in Bruay, about ten miles behind the front lines. On 19 December they moved back into the line at Vimy Ridge, taking over a portion of the line dominated by German positions on The Pimple, a natural fortress atop the north end of the ridge. They and the 50th Battalion served alternating shifts in the fire trenches until the 46th was relieved by the 13th Middlesex Regiment on 4 April 1917. Stanley Griffin son of Mr Sharland Griffin killed on March 27th. On the 1901 census Stanley Griffin is aged 8, living next door to ‘Berwyn’ in what is now Dunyeats Road. This is possibly where Griffins office can still be found. His father Elias S. is a builder and brother Alfred a carpenter. He has two sisters Rosella and Nora, both older than him, and two brothers Fred and Arthur, both younger than him. On the 1891 census Elias Sharland Griffin can be found as a Carpenter & Joiner, and Bird Stuffer. Eric Harris is remembered on Broadstone First School Memorial. I have been unable to find any other confirmed information about Eric Harris. who died age 29 on 23 February 1917. He was the son of Richard and Ellen Hart, of Oak Cottage, Broadstone. The Cemetery was begun, in an apple-orchard, in July, 1915, and used until April, 1918, by fighting units and Field Ambulances; these original burials are in Plots I, II and III, and Rows A and B of Plot IV. In April and May, 1918, German burials were made in Plots III and IV. After the Armistice, 426 German graves were removed to other cemeteries; and British graves were brought in from smaller burial grounds and from the surrounding battlefields. There are now over 1,500 1914-18 war casualties commemorated in this site. Of these, over half are unidentified and special memorials are erected to nine soldiers from the United Kingdom believed to be buried among them. Lance Corporal Hart is also remembered on Broadstone War Memorial in the recreation ground, on the Memorial in St Johns Church Broadstone, and Broadstone First School Memorial as Richard. On the 1891 census Albert Hart is found living next to the school in Broadstone with his father, Richard, a mariner, his mother Ellen, four sisters, Mary [a pupil teacher], Emma, Annie & Flora, and two brothers William and Edward only 8 months [who was killed in July 1916 in Iraq]. In 1901 he is living in Wimborne Road [now Dunyeats Road, possibly the same as in 1891]. His father is not listed, his mother is the head of the household. Emma is now a dressmaker, Annie a school mistress, William a pupil teacher, and Albert is aged 13, Edward aged 10, and another brother Henry aged 7. William Percy Hart is listed in Kellys of 1927 and 1931 at the School House, and on Kellys 1935 and 1939 living at ‘Kilndown’, Upton Way. He is still remembered by his past pupils in Broadstone in 2014. Son of Richard and Ellen Hart, of Oak Cottage, Broadstone, Dorset. Amara was occupied by the Mesopotamian Expeditionary Force on 3 June 1915 and it immediately became a hospital centre. The accommodation for medical units on both banks of the Tigris was greatly increased during 1916 and in April 1917, seven general hospitals and some smaller units were stationed there. Amara War Cemetery contains 4,621 burials of the First World War, more than 3,000 of which were brought into the cemetery after the Armistice. 925 of the graves are unidentified. In 1933, all of the headstones were removed from this cemetery when it was discovered that salts in the soil were causing them to deteriorate. Instead a screen wall was erected with the names of those buried in the cemetery engraved upon it. Private Hart is also remembered on Broadstone War Memorial in the recreation ground, on the Memorial in St Johns Church Broadstone, and Broadstone First School Memorial as Frank. We desire to express the sympathy of the whole parish to Mrs Hart and her family in the death of her son Frank, of 2/4th Bn. Hampshire Regiment, who died in hospital at Basra. On the 1891 census Edward F Hart is found living next to the school in Broadstone with his father, Richard, a mariner, his mother Ellen, four sisters, Mary [a pupil teacher], Emma, Annie & Flora, and two brothers William and Albert [who was killed in action in February 1917]. In 1901 he is living in Wimborne Road [now Dunyeats Road, possibly the same as 1891]. His father is not listed, his mother is the head of the household. Emma is now a dressmaker, Annie a school-mistress, William a pupil teacher, Albert aged 13, and brother Henry aged 7. William Percy Hart is listed in Kellys of 1927 and 1931 at the School House, and on Kellys 1935 and 1939 living at ‘Kilndown’, Upton Way. NB. There is a discrepancy between the Commonwealth War Graves commission and the Church Magazine. The first gives him as 1st/4th Bn., Hampshire Regiment and the second as 2/4th Bn., Hampshire Regiment. Son of George and Emma Jane Hoare, St. James Terrace, Birchington, Kent. Remembered with honour VILLERS-BRETONNEUX MILITARY CEMETERY, Somme. V.I.A. This cemetery was made after the Armistice when graves were brought in from other burial grounds in the area and from the battlefields. There are now 2,141 Commonwealth servicemen of the First World War buried or commemorated in this cemetery. 608 of the burials are unidentified but there are special memorials to five casualties known or believed to be buried among them, and to 15 buried in other cemeteries whose graves could not be found. Private Hoare is also remembered on Broadstone War Memorial in the recreation ground and on the Memorial in St Johns Church, Broadstone. Remembering Thomas Hoare whose home was not in this part of the country but who had been employed by Miss Kennedy for the past four years. Miss Kennedy owned Delph House in Broadstone. He died age 21 on 19 May 1920. He was the son of Charles and Sarah Holloway, of Creekmoor, Poole. Private Holloway is also remembered on Broadstone War Memorial in the recreation ground and on the Broadstone First School Memorial. It would appear that Albert died of wounds after returning home. On the 1901 census Albert was aged 2 living at Waterloo with his father Charles, a cattleman, and his mother Sarah. He had two sisters Ethel aged 10 and Winifred aged 6 months, and a brother Charles who was 7. By 1911 there were 10 siblings listed on the census. who died on 12 June 1915. Sanctuary Wood is one of the larger woods in the commune of Zillebeke. It was named in November 1914, when it was used to screen troops behind the front line. There were three Commonwealth cemeteries at Sanctuary Wood before June 1916, all made in May-August 1915. The first two were on the western end of the wood, the third in a clearing further east. All were practically obliterated in the Battle of Mount Sorrel, but traces of the second were found and it became the nucleus of the present Sanctuary Wood Cemetery. At the Armistice, the cemetery contained 137 graves. From 1927 to 1932, Plots II-V were added and the cemetery extended as far as 'Maple Avenue', when graves were brought in from the surrounding battlefields. Second Lieutenant Hume is also remembered on the Memorial in St Johns Church, Broadstone. George Minchin Hume is to be found on the 1901 census living at 61 Osborne Road, Jesmond, Northumberland. His father was a surgeon, Geoffrey Haliburton Hume. His mother Francis was born in Canada. George had two brothers at this time: William and Norman who were both Medical Students, and two sisters Phyllis and Constance. Olive Hume is not included on this census return, but a nurse, cook, waiting maid, housemaid and nursemaid are part of the household. I believe George, if he lived, would have been the Uncle of Cardinal Basil Hume. who died age 28 on 12 March 1915. 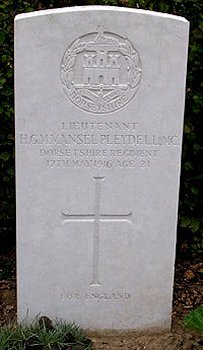 Son of Lt. Col. and Mrs. Mansel-Pleydell, of Whatcombe, Blandford, Dorset. Lt Mansel-Pleydell is remembered on Broadstone War Memorial in the recreation ground and on the Memorial in St Johns Church, Broadstone. He was the first to be mentioned on the church Roll of Honour. Spanbroek Mill - On the morning of March 12th on the Messines Ridge the British artillery had been bombarding the enemy’s positions since 7 a.m. but the mist made it impossible to observe the result. The assembly trenches were only half dug and were full of water. In such cover as those shallow trenches afforded the two battalions crouched all the morning while the German shells crashed down about them in answer to the British fire. There were many casualties but a message arrived to say that the First Army were making excellent progress down south, that there were indications of the Germans withdrawing troops from these parts and the attack should not be delayed a moment longer than possible. The British artillery opened their bombardment at 2.30 p.m., and at 4.10 p.m. the leading companies of the two battalions rose from the waterlogged ditches, crossed the front-line trenches under a hail of bullets and plunged forward through knee-deep mud to the assault. The enemy’s fire was fierce and deadly, and officers and men went down at every step. The survivors reached the German wire entanglements and struggled through such gaps as they could find. The leading party broke through the wire and stormed the hostile parapet. Further to the right another small party had succeeded in breaking through the German lines and seizing a group of ruined houses. That was the total success. 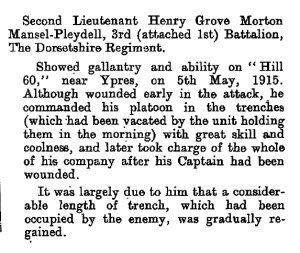 The rest of the two attacking companies of the 3rd Worcestershire had been shot down, and were lying killed or wounded on the broken mud between the trench-lines. The other two companies of the Battalion had been ordered not to move from the assembly trenches. Soon the enemy began to press inwards along the trenches with bomb and bayonet against the two little parties, which had penetrated their position. Isolated though they were, the Worcestershire lads held firm and repulsed all attacks for over three hours. But no help came: instead the British artillery, misinformed as to the position, commenced again to bombard the German front line, and annihilated the helpless party in the ruined buildings. Darkness closed down and Lieut. Martin was ordered to evacuate the captured trench. They sent back all their wounded before they finally withdrew. The losses were severe. 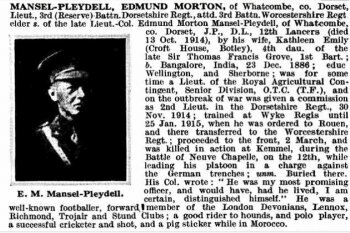 The casualties of the Battalion were nearly 180, including nine officers killed including E. M. Mansel-Pleydell (Dorsets, attached), and 38 other ranks. Wounded, 99. Missing 32. One VC, four DCMs were awarded that day. 1st Dorsetshire Regt. Died 17th May 1916 Aged 21. Son of Mrs K. E. Mansel-Pleydell, of 13, Foulis Terrace, South Kensington, London. although almost certainy died at Thiepval. Miraumont was occupied by British troops at the end of February, 1917, lost on the 25th March, 1918, and retaken by the 42nd (East Lancashire) Division on the following 24th August. It was later "adopted", with Colincamps and Courcelles, by the town of Burnley. The Communal Cemetery was largely used by German troops, and soldiers from the Commonwealth were buried in it by the enemy. There are now nearly 30, 1914-18 and a small number of 1939-45 war casualties commemorated in this site. H G M Mansel-Pleydell MC is remembered on Broadstone War Memorial in the recreation ground. London Gazette Issue 29215 published on the 2 July 1915. Instituted by King George the Fifth in 1914. 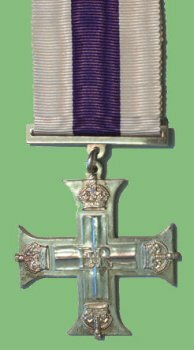 The Military Cross is awarded to commissioned and warrant officers for distinguished and meritorious service in battle. For additional acts of bravery, a straight silver bar was awarded. During the Great War 2,885 of these medals were awarded to British officers. Both Mansell- Pleydell and his friend Capt William Algeo, son of the Rector of Brownsea Island, were both immensley popular with their men. The action which resutled in the deaths of the two distinguished Dorsets was reportedly a joint venture of their own initiative into No Man’s Land in order to locate the exact position of a troublesome machine gun emplacement which had been causing the battalion problems…… an eyewitness account given by CSM Ernest Shephard described what happened on that morning: At 10am this morning, without saying anything, Capt. Algeo and Lt. Mansel-Pleydell went out from sap. They were seen crossing No Man’s Land between sap and wood. When nearly up to the edge of the wood Mansell-Pleydell was seen to beckon, and he and Captain ran into wood. There was a scuffle and Capt Algeo was heard shouting ‘Hands up, hands up, put it down’. A volley of rifle fire and revolver shots followed, a scream, then silence…… the enemy reported to the American Embassy both Algeo and Mansell-Pleydell as ‘found dead near Thiepval’. [In fact they had been buried at Miraumont]. who died on 24 April 1915.
of 124 Fourth Avenue, North Pelham, New York, USA. Hamilton Nelson’s name can be found on the Memorial in St Johns Church Broadstone. William Nelson, editor of the International Studio … received official notice from the Adjutant General of the Canadian War Office at Ottawa yesterday that his son Private Hamilton de Beauvoir Nelson, had been killed in the trenches in France. Private Nelson was in the seventh battalion which was sent direct from Salisbury Plain to France three months ago. He was only 18 years old and was about to receive a commission as Second Lieutenant in the East Yorkshire Regiment. His Uncle, Colonel Benson, was Commander of this regiment and was killed at the beginning of the fighting near Ypres. Nelson enlisted in the Eighty Eighth Victoria Fusliliers at Lake Shawnigan, British Columbia. From there he was sent to Val Cartier Camp in Quebec where he was in training before being ordered to Salisbury Plain. He was to be made a Second Lieutenant for bravery on the firing line. Hamilton de Beauvoir Nelson – the nephew and adopted son of Mrs Benson, who was in the British Columbia Regt and who has been missing for so many months that there now seems no hope that he can have become a prisoner of war. 17th Battalion,Royal Fusiliers who died age 27 on 27 July 1916.
husband of Sarah Newman, of 7, Greenhill Terrace, Portland. On 1 July 1916, supported by a French attack to the south, thirteen divisions of Commonwealth forces launched an offensive on a line from north of Gommecourt to Maricourt. Losses were catastrophic and with only minimal advances on the southern flank, the initial attack was a failure. In the following weeks, huge resources were deployed in an attempt to exploit the modest successes of the first day. However, the German Army resisted tenaciously and repeated attacks and counter attacks meant a major battle for every village, copse and farmhouse gained. At the end of September, Thiepval was finally captured. The Battle of the Somme finally ended on 18 November. The Thiepval Memorial, the Memorial to the Missing of the Somme, bears the names of more than 72,000 officers and men of the United Kingdom and South African forces who died in the Somme sector before 20 March 1918 and have no known grave. Over 90% of those commemorated died between July and November 1916. Private Newman is also remembered on Broadstone War Memorial in the recreation ground and on the Memorial in St Johns Church, Broadstone. Found on the 1891 census living at the grocers shop in Chickerell, Alfred was the son of the grocer and provisions dealer John Newman and his wife Elizabeth. Alfred had two sisters Matilda and Charlotte, and two brothers William and Robert. In 1901 the family is living at 13 Ventnor Road, Portland, their father still a grocer. By this time Alfred is aged 12, Matilda is a grocers assistant, William an electrical engineer on his own account, Robert a carpenters apprentice, Charlotte a grocers clerk and there is another son Charley aged 8.
who died on 26 September 1914. He was the son of John and Frances Holdsworth Northway. Remembered with honour WARMBAD CEMETERY, Namibia. At Warmbad Cemetery, Namibia, there are seventeen Commonwealth burials and a memorial stone commemorating five who have no known graves. All but one grave were brought in after the armistice. Thirteen are graves of men killed at the battle of Sandfontein on 26 September 1914 and originally buried there and the memorial stone commemorates five who were killed in the same battle. Lieutenant Northway is also remembered on Broadstone War Memorial in the recreation ground and on the Memorial in St Johns Church, Broadstone. Lt. Northway was part of a small scouting party holding Sandfontein, at the end of a lengthy line of communication. It proved impossible to reinforce this detachment rapidly when they were attacked by a superior force of Germans amounting to 1800 men with 10 guns. The German force was able to move rapidly and securely by means of the railway whereas the South African forces in the area were dependent on lengthy, slow and insecure reinforcement by ox-cart. The S.A. force resisted until their C.O. was made aware of the number of guns opposing them. He then surrendered in order to avoid unnecessary and pointless loss of life, a decision supported by his Brigadier General, H. T. Lukin. Lieutenant Northway was the brother of Roland Thomas Northway of ‘Southmead’ Hillbourne [York Road], a solicitor in Kellys 1907, 1911 and 1915. He had grown up, according to the census returns of 1891, and 1901, in Sussex and the Isle of Wight. 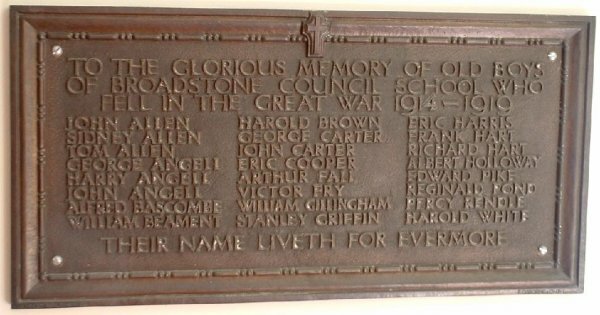 On Broadstone’s War Memorials in the recreation ground, St Johns Church and Broadstone First School Broadstone Ratepayers Association launched an appeal for funds in May 1945 to erect the War Memorial Hall in Tudor Road. It was opened in 1956.
who died age 25 on 21 November 1942.
and husband of Iris Myrtle Andreasen, of Broadstone. Remembered with honour BROADSTONE CEMETERY Sec. B. Grave 488.
in the recreation ground, and on the Memorial in St Johns Church, Broadstone. 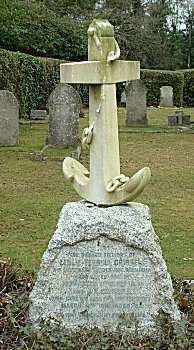 ALSO REMEMBERED ON ELMSWELL WAR MEMORIAL, SUFFOLK. on the Memorial in St Johns Church, Broadstone and on the Broadstone First School Memorial. G.D. Belben is remembered on Broadstone War Memorial in the	recreation ground. On 18 February 1944, HMS Penelope (Capt. George Devereux Belben, DSO, DSC, AM, RN) was leaving the Anzio area to return to Naples when she was torpedoed in position 40º55'N, 13º25'E, by the German submarine U-410. The torpedo struck her in the after engine room and was followed, 16' later, by a second one which hit in the after boiler room, causing her immediate sinking. The remarkable point of the attack by U-410 is that the cruisers was making 26 kn when hit. As far as can be ascertained, this is a unique case in the history of submarine attacks in all of WWII, no other ship running at such speed was ever successfully attacked. 415 of the crew, including the captain went down with the ship. There were 206 survivors. Information here about the Texel Disaster and the HMS Esk. husband of Bertha Kearley, of Waterloo, Poole. Remembered with honour CHUNGKAI WAR CEMETERY 1.O.9. containing the remains of those who died on the Burma Railway. and on the Memorial in St Johns Church, Broadstone. died at Cornelia Hospital, Longfleet Road. William Matthews is remembered on the Broadstone First School Memorial. Age 20 W B McClellan is remembered on Broadstone War Memorial in the recreation ground and on the Memorial in St Johns Church, Broadstone. husband of Grace M. McComish, of Parkstone, Dorsetshire. and on the Broadstone First School Memorial. husband of Eira Maud McComish, of Parkstone, Dorset. Information here about the Ju-88 and the HMS Trinidad. Husband of Katie Ivy Myles, of Broadstone. husband of Violet Elizabeth Ellen Peach, of Poole. Remembered with honour BROADSTONE CEMETERY Sec. B. Grave 521. Marcus Peach is remembered on the Broadstone First School Memorial. on the Broadstone First School Memorial. His home address was 20 Northbrook Rd, Broadstone. He attended Broadstone School and worked at W H Smiths Bookstall on Broadstone Station (probably until time of conscription/enlistment). He was the youngest of 5, with 1 Brother & 3 Sisters. William Phillips was Single. Information here about the U96 and the SS Almeda Star. 1st Bn., Parachute Regiment, A.A.C. of Broadstone, Dorset. Remembered with honour MEDJEZ-EL-BAB WAR CEMETERY, Tunisia. of Broadstone. Dorset. Remembered with honour BELGRADE WAR CEMETERY Coll. 2. E. 5-8. Son of Edward and Elma Ann Squire, of Lytchett Minster. Remembered with honour LYTCHETT MINSTER CHURCHYARD S.E. part. Ralph Squire is remembered on the Broadstone First School Memorial. Son of Tom and Annie Florence Strange, of Poole. Son of Edward Victor and Rosalie Nellie Watkins, of Broadstone. Dorset. Remembered with honour OUED ZARGA WAR CEMETERY Tunisia. is remembered on the Broadstone First School Memorial. 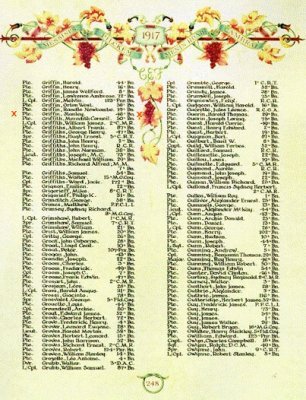 On Commonwealth War Graves Commission records of Civilian War Dead. who died age 79 on 24 April 1944. Little Leigh, Cheshire. Died at Weston Cottage. Remembered with honour at Poole Municipal Borough. who died age 63 on 11 April 1941. Firewatcher; of Northbrook Farm, York Road, Broadstone. Son of the late John Spencer Coates; husband of Flora Oliphant Coates. Horsham, Sussex; wife of John Spencer Coates. Died at Northbrook Farm, York Road. Remembered with honour Poole Municipal Borough. who died age 26 on 22 June 1942.
wife of Donald James Hatcher, of 238 Vale Drive, Bitterne. Died at 238 Vale Drive. Remembered with honour Southampton County Borough. Husband of Daisy I. H. Sparkes, of Pen Y Bryn, Roman Road, Broadstone. Died at Bourne Valley Gas Works. , and on the Memorial in St Johns Church, Broadstone. slight pauses in the last line, after "We" and before "Them"
the graves of those buried here. Thanks too for his proof reading. the school. To Julia Wenham for her information and encouraging words. John Palmer for setting up this website. Collected, formatted, hyperlinked, hand-coded, and copyright © 2014, . All Rights Reserved.